Born in Illinois in 1900, Della Taylor spent her childhood in Los Angeles. From her earliest years, Della had a connection with the National Park Service as her brother, newspaper correspondent Frank Taylor, was the author of Oh, Ranger (1928), a humorous account of national parks management. Oh, Ranger was co-written with Horace Albright, conservationist and Director of the National Park Service from 1929-1933. Frank Taylor was the “ghost writer” for many of Albright’s publications. 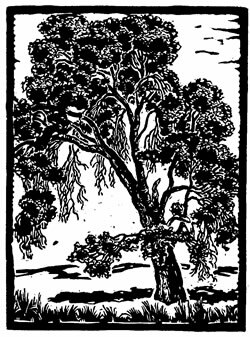 In 1923, Della graduated from Stanford University and entered into art study at the California School of Fine Arts in San Francisco (now known as the San Francisco Art Institute) and the National School for Fine and Applied Arts in Washington, D.C. She also received private instruction from prominent artists, such as illustrator, engraver, and painter Blanding Sloan in San Francisco, painter and author Chiura Obata in Yosemite, and painter Mark Tobey in Seattle. Della Taylor married Herman Hoss, who was the Federal Magistrate and treasurer of Yosemite Park and Curry Company, run by the Tresidders. Della and Herman lived in Yosemite Valley from 1928 until 1942. While in her seventies, Della Taylor Hoss traveled to the rugged White Mountains to see the Bristlecone Pines, the oldest living organisms on earth. She drew 15 pencil and charcoal drawings of the magnificent trees that have been widely praised. Della Taylor Hoss died in 1997 at the age of 97. Based in part on the excellent biography of Della Taylor Hoss found on the website of the Hoss Family entitled “Creative Offsprings,” which chronicles the artistic accomplishments of the family. 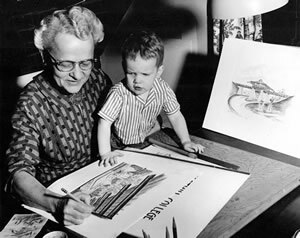 – Photo of Hoss and her grandson Martino from the website “Creative Offsprings,” chronicling the artistic accomplishments of the Hoss Family. 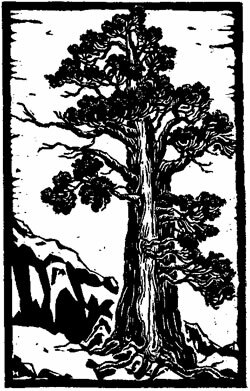 - Linoleum block cut illustrations from Trees of Yosemite – (1) Sierra Juniper and (2) California Black Oak.